When Carlos showed up to the dock – I was thrilled. Our “Women’s Permit Quest” group was going to meet one of my favorite and most influential guides on the island. I walked down the dock to greet Carlos and his grandson, Valmont. I was planning on seeing Val, but Carlos was a surprise. He said, “I’m bored at home so I came to fish with your permit women.” Big smile. I first met Mr.Carlos in 2009, when I was Director of Fishing at El Pescador Lodge – here on Ambergris Caye, Belize. He told me I was not the fisherman Bob was – my predecessor who had passed away too early in life. We had never fished at that point, but he was letting me know I had big shoes to fill. Bob was known for his fluid left hand casting – and uncanny ability to land ridiculous numbers of permit on fly. I did have big shoes to fill because the guides loved him. Gaining the respect of the guide team was a priority for me. Like I told them, “There is no reason for me to come down here, change my whole life, unless I know we can get along.” So from that point, a solid group of San Pedrano multi generation male fly fishing guides decided to be on the same team with me. Mr.Carlos was the most senior guide at 70. Clients would marvel at how he walked around the gunwale of the panga – with ease and grace. A small fit man that moves like a “ninja,” another term for Mr. Carlos. The first few years of my job I had time in the middle of the day to fish. That changed later on down the road, but that time I had – I fished a lot. I would have the guides drop me off on their way fishing, and pick me up on the way home. I waded miles and miles of Ambergris Caye, searching for permit. I would, and sometimes still do, talk to Bob. “Where are they today?” I have had some amazing responses. Sometimes we spend enough time out there, we get little gifts. New fish spots. When I fished with Mr.Carlos he would tell me Bob stories. But when you spend the day with Mr.Carlos, you are going to hear about a lot of things. His two favorite topics – his family and the weather for fish. Carlos is the patriarch for his family, the Marin’s. His four sons are ranked as the best fly fishing guides on the island, and now his grandson’s are killing it as well. There is a lot of pride with stories at their dock back at home at the end of the day. But we all know it’s a miracle that Carlos is still running around at 78 on guide boats. One late January morning, I received a call in the middle of the day. Carlos’s clients were calling me to tell me Carlos had fallen from the platform and was knocked unconscious until they got out of the boat to rescue him. They were able to get Carlos back into the boat. And thank God these guys were guides up in Alaska, because they knew how to run the skiff back to San Pedro for help. Carlos was rushed to Belize City where he was diagnosed with a cervical spine fracture. He was paralyzed from mid waist down. In my other life I was an RN. I immediately felt like we needed to get Carlos up to Mexico for the best healthcare. But Carlos insisted on keeping his neurosurgeon in Belize City. His physician told him that he would be able to avoid surgery if he would rest until the nerve swelling decreased. This was in the hope that he would gain at least minimal function. So his family went to work! They moved him to the downstairs room where his wife, Miss Amelia, his daughter and daughter in law – all took shifts to turn him and provide for his basic needs. The entire town of San Pedro came together to offer food and donations for escalating hospital bills. I contacted some of his favorite clients for fundraising. It was amazing how people like well known fly fishing enthusiast, Dave Decker, came on board to offer well needed funds. Dave and a substantial list of client friends, guides and the fly fishing industry, started a motion to imitate the well known, Don Hauley tournament – to raise money for fly fishing guides who are not insured for healthcare. 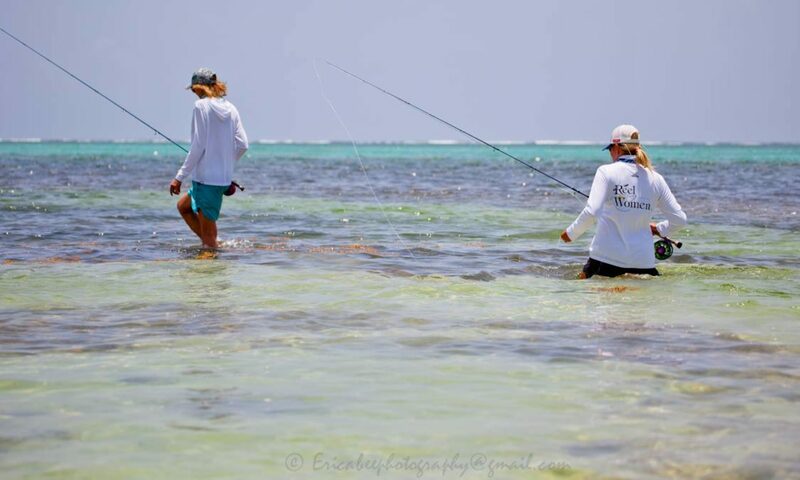 Our local tournament now raises money for our guides on Ambergris Caye. Carlos not only had his bills taken care of – he had the opportunity in his life to realize how much he is loved and respected. 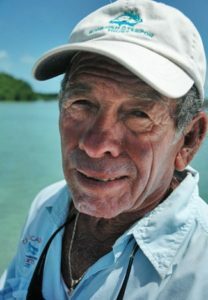 A true pioneer in saltwater fly fishing, his days on the water and what he has learned has been passed on to all of us. 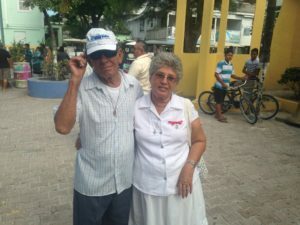 Miss Amelia and Mr.Carlos have been married for over 50 years. I always would remark to Carlos, “You don’t have to worry, you have Miss Amelia praying for you everyday!” Miss Amelia is very active in our local Catholic Church -and she is there everyday! After the accident, she continued her prayers. Two months after the accident, Carlos was able to move his arms and legs. The saying, “You can’t keep a good man down,” is an understatement for this guy! He would use therapy balls to strengthen his hands, and start slowly to get back to his walking. Needless to say, we all witnessed a miracle here in San Pedro. Carlos now walks several miles a day unless he is hitching a ride in one of the skiffs with his grandsons to help guide. So here we are, years later. I now run my own business through Reel Women Fly Fishing Adventures here in San Pedro. 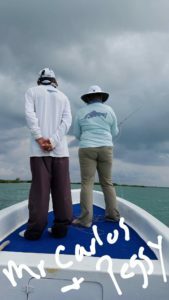 I work with local licensed Belizean Tour Guides – and get them up to speed with the skills needed to be a full time fly fishing guide. My fly fishing panga, “La Sirena” goes out everyday. Sometimes I’m guiding, and sometimes I’m praying from the dock that the day is safe and fun. 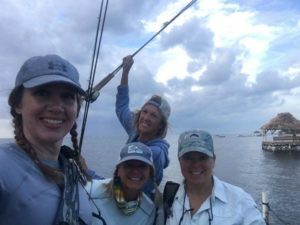 Just last week I had two groups of women here on the island to pursue their dreams for chasing permit on fly. Group one was lucky, five permit were landed. Group two had tough weather, but they got to meet Mr.Carlos. I had no idea how much emotion I had about seeing him on the dock that first morning he decided to fish with our group. I was telling the story at dinner one evening, it was our last night of the trip actually. And the tears came down as I told this story of how an already legendary fly fishing guide here in San Pedro – became more legendary. Mr.Carlos and Miss Amelia after church last Sunday. 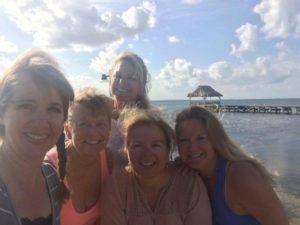 Amy, Margie, Susan and me gearing up for the day to chase permit!